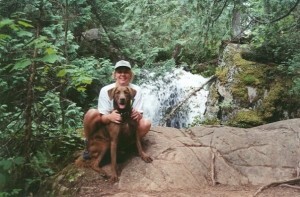 My name is Pam Culver and I am a foster home for and volunteer with the Chessie Rescue of Wisconsin. I got my first Chesapeake Bay Retriever, Marley, in May of 1995. Marley was a great dog that loved everyone and everyone loved Marley. Marley went everywhere with me and we had many adventures and fun but I have learned that Marley was a very calm, well behaved Chessie. I got Marley as an 8-week old puppy and she died in October, 2009 at the age of 14. 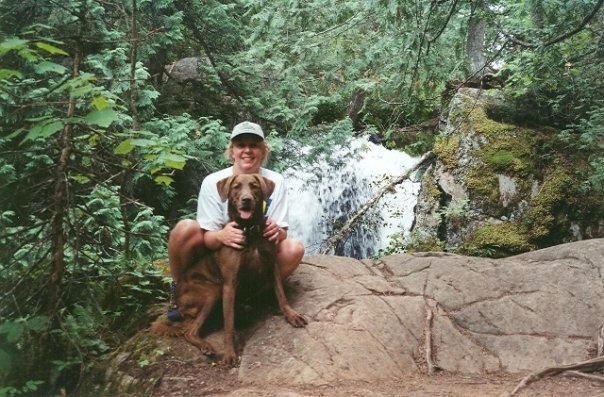 Marley (1995-2009) with me in the Boundary Waters, MN. After Marley died, I was not ready to commit to another dog long-term but my house was so quiet. I decided I would foster dogs for awhile until I was ready to “commit”. I contact the Chessie Rescue of Wisconsin and completed the paperwork to become a foster. About 3 weeks later, I received a call that there was a 1 year old female Chessie at a shelter near Duluth, MN that needed to be fostered. I agreed to meet the Chessie Rescue volunteer in Minneapolis and pick up “Tiny”. My one condition was that I could rename the dog because I was not going to call her Tiny. The volunteer called me the morning I was to meet her to let me know “Tiny” was HUGE and liked to climb in the dryer! Oh my, the adventures begin…. Lula (Birthdate unknown – 2013) and me the year before Lula passed away. Meet Lula, the 115 pound female Chessie that was no where near the age of 1 but more like 8 or 9 years old. Lula came to me with a broken spirit and even more broken body. She refused to make eye contact, she wanted nothing to do with me, my house or my life. She wanted to live in my garage in a crate that was too small. 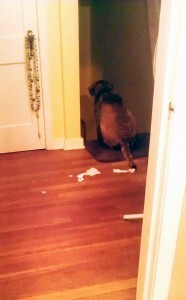 She wouldn’t eat and she was incontinent. A few days into this adventure, I called my vet as I noticed she was in pain and dragged her back legs. After several visits and x-rays, we discovered she had severe hip dysplacia in both hips with advanced arthritis, two ruptured ACLs, Lyme Disease, giardia, and spay incontinence and she WAS NOT 1 year old as her teeth were very worn, chipped and in some cases missing! Wow, now what? This dog was going to require extensive pain management and was not adoptable. First foster dog – first permanent foster but for how long…. The goal with Lula was “Quality of life versus Quantity of life” and that is what we did. Lula lived with me for 3.5 years and taught me so much about life, spirit and perseverance. We wrote a book together (Lula and I), fostered several other Chessies together and touched many, many lives through her antics, personality and disabilities. I learned more about dog behavior from Lula and I will forever miss her presence. 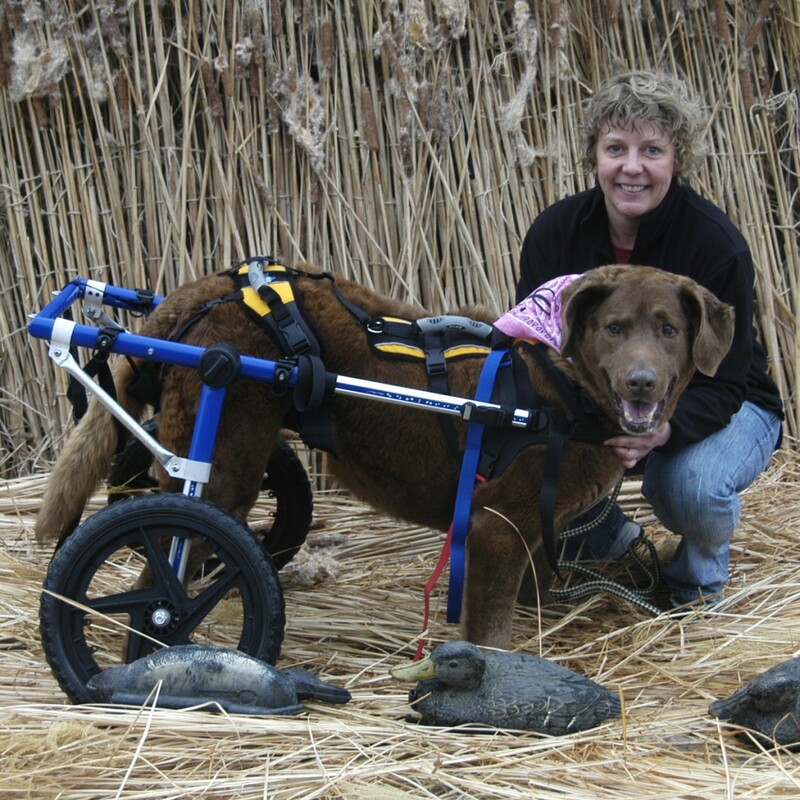 To learn more about Lula’s adventures, visit her blog The Misadventures of Lula – Rescue Chessie. I am a marketing consultant, own a marketing and graphic design business, Gathering Waters Design. I also teach marketing at Western Technical College in La Crosse, WI. The experience I have gained and write about has been obtained with my own Chessies, Marley and recently Radar, and the dogs I have fostered, Lula and am currently fostering, Louie.